You need install Exuberant Ctags or universal-ctags at first. People using macOS will find there already exists a built in program named "ctags". This program should be deleted! If you want a quick start, jump to the end of this article. You can use company-etags.el from company-mode to complete HTML/JS/CSS code. That's OK for most programming languages. But not enough for web developers who use web-mode. 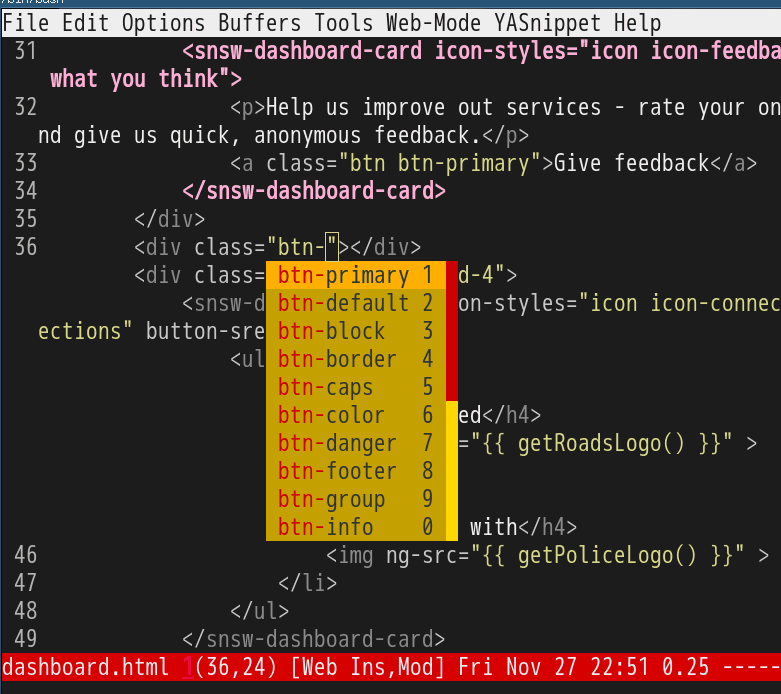 First, you need upgrade web-mode to latest version so that when inputting "btn-" or "data-" code completion still works. You need above setup because web-mode conditionally inherit from prog-mode. You can `M-x eval-expression (derived-mode-p 'prog-mode)` to test whether current mode inherits from prog-mode. Thanks for Dmitry Gutov pointing out that js2-mode actually inherits from prog-mode because it inherits from js-mode which inherits from prog-mode. Tested on Emacs23 and Emacs24, Emacs 25. Step 1, open shell and goto project root. Run command ctags -e -R. A file named TAGS is created. All done. Use company-mode as your wish!